You're riding along on your favorite trail on a nice winter morning. It's frozen solid and you're having a great ride. After awhile, the sun comes out and a few minutes later the beautiful hardpacked trail has turned to mush, and you and your bike are coated with mud. In this article, originally intended for the GORC newsletter, Sam Mitchell explains how this happens. 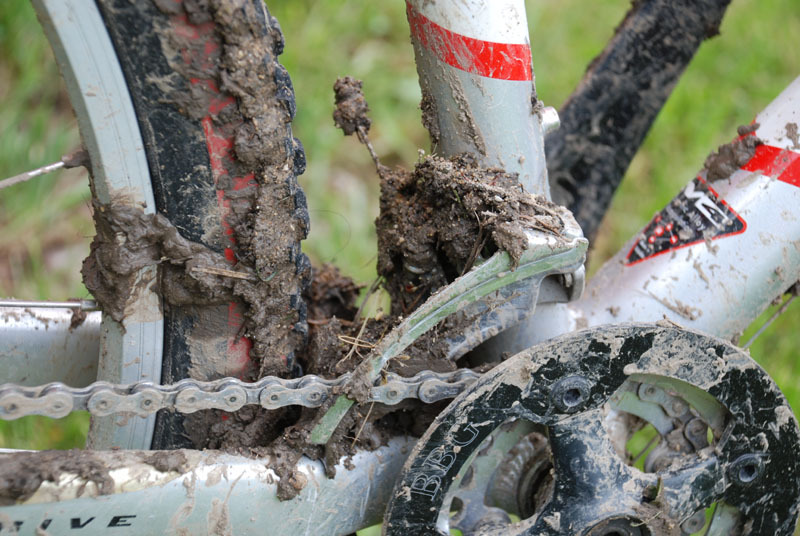 Every winter, the dirt we love to ride on freezes when the local atmosphere goes below 32 degrees F. The water in the dirt freezes and acts as a cement, making the dirt more solid than at other times of the year. The amount of water in the dirt varies from none (dusty) to saturated (muddy), that percentage mostly depending on the fineness of the material making up the surface. Very fine materials like clay can hold lots of water before they become plastic, when their shape can be changed easily. Water can act as cement or lubricant, making dirt solid or liquid. While there is some warming of the surface of the earth by the hot core of the planet, it is tiny and constant, and does not enter this process. The temperature of the air controls the process. As cold weather continues, the thickness of the frozen dirt increases. We do not notice this because the dirt was solid to begin with, and remains solid as the ice thickens, and we have a good ride. In the central Midwest, frost depth can reach a foot or more, and 18 inches is considered safe for burying water pipes, to see they do not freeze. In the late 70s here, the winters were very cold, and the frost occasionally was more than 18 inches. In Minnesota, the frost can be several feet deep, and in Alaska the frost line is very deep and can be permanent, “permafrost”. The trouble for our trails begins on warm, especially sunny days, in late winter or spring. The surface reaches 32 and the ice begins to melt, at first just making the trail slick. Much more worrisome is when the thaw continues, melting the water to a depth that does not yet reach the bottom of the frozen dirt. The remaining frozen layer is an impervious blockage to the melted water above, which in warm, unfrozen dirt would percolate down from the surface, as it would in a summer rain, keeping the dirt from becoming plastic and too soft. When the last of the frozen dirt does thaw, percolation can take place, the water descends from the surface, and the trail dries and becomes ridable. There can be several freeze/thaws over a winter, making a rider very frustrated. Full thawing of the frozen layer can take days, maybe weeks in 35 degree weather, and use of the trails during the thaw can be destructive to them. After deep ruts dry and harden, they are slow to wear away, difficult to repair, and can cause a crash. Different parts of the trail thaw at different rates depending on the material at the surface, and whether the trail faces the sun or not. There is not much science for predicting the thaw in a particular place. A rider can start a ride on a stable trail, then come to an incompletely thawed part. TURN AROUND, DO NOT RIDE ON THAWED TRAILS. That can be very frustrating, but is for the best, for all trail users. The best way to educate others about thawing trails is to update the trail condition on our website.